LIVERPOOL WILL OPEN a new retail space in Dublin city centre next month. The store will be located in the Ilac Shopping Centre on Henry Street and will stock replica kits, training apparel and various other merchandise. An official launch will take place on 3rd October when club legend Didi Hamann will be on hand to mark the occasion and take part in a meet and greet with fans. “LFC is one of the most followed football teams in Ireland, so it’s fantastic that we’ve secured a store in the heart of Dublin city centre. 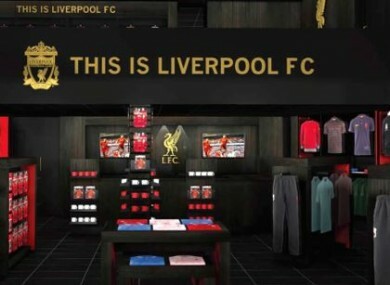 Email “Liverpool to open an official store in Dublin city centre”. Feedback on “Liverpool to open an official store in Dublin city centre”.